TRIOFIX TRF is a coupler of hydraulically operated, 3-pin supported rigid connection type of combined friction- and tooth-engagement principle, capable of assuring an excellent seaworthiness equivalent to that of ordinary cargo ships and, in addition, adapting itself to the change of draught of barge due to loading and unloading. Connection by means of TRIOFIX TRF can take place at any arbitrary draught relationship in a short time by remote-control from the bridge of pusher, and the time- and manpower-saving combined with expectable high speed and excellent seaworthiness assures the high operational economy even in ocean areas. TRIOFIX TRF comprises two side couplers and a bow coupler, all fixed to the structure under the superstructure deck of the pusher. The Connecting Pin supported by the Main Bearing, fixed to the hull, of the Side Coupler has a Projection at its outer end. The Pres-sing Shoe slidably mounted on the Projection is pushed out by the function of sub-cylinders in the Connecting Pin and then the Pin is pushed out by the function of the main cylinder in the Pin so that the pressing Shoe may be inserted into the Connecting Slot of the barge. The hard rubber lining on forward and rearward faces of the Shoe are pressed onto the corresponding walls of the Slot to generate strong friction preventing vertical slip of the Shoe. This stage is called F-Connection. Then, the sub-cylinders are depressurized and main cylinder is actuated simultaneously to push out the Connecting Pin further so that the Tip at the outer end may engage into the teeth of Rack in the Slot. Thereafter, all cylinders are kept under pressure so that the Shoe may be pressed into the Slot and the connection with Side Couplers is finished. This stage is called R-Connection. Next, the Connecting Pin supported by the Main Bearing, fixed to the hull, of the Bow Coupler is extended out by the function of a hydraulic cylinder in the inside so that the Tip at its outer end may engage into the teeth of the Rack fixed to the barge hull at the centerline and, thus, the 3-pin supported rigid connection is realized. The process of connection with Side Couplers beginning with F-Connection is automated. ---Triofix TRF can assure a superexcellent seaworthiness equivalent to that of ordinary cargo ships even in ocean services. The models can be selected to comply with the required sea state. 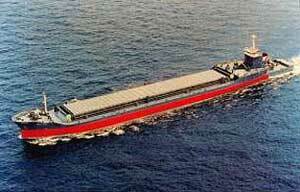 ---Triofix TRF realizes a rigidly connected pusher-barge combination which will move as a single vessel in waves. The crew on board are free from shocks, vibrations and noises during connected navigation and can enjoy a same level of comfortableness as on board of ordinary cargo ships. ---Because of absence of relative motions between the pusher and barge, the clearance between two hulls can be reduced to the minimum to suppress the generation of eddies and attain a high speed which was unexpectable with conventional pusher-barges. ---Triofix TRF can connect the pusher to the barge, without previously adjusting the draught relationship, practically at any point within the whole range of change of draught relationship. ---For connection and disconnection, Triofix TRF is remote-controlled by the captain's finger-tip from the bridge. These works are accomplished in a short time without need of any muscle work. ---Connection and disconnection works are made from the pusher only and the crew members have no need to go over to the barge. ---During loading and unloading of the barge, the side couplers are kept in F-Connection and the bow coupler in Connection. Disengage-ment of bow coupler, loosening of side coupler and reconnection, in series, are repeated at proper time intervals under automatic control to adapt the pusher draught to the gradual change of barge draught so that connection can be kept even during cargo-handling.